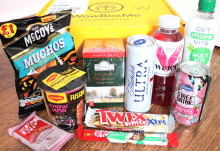 Family Pack – 24 to 32 full size and sample snacks including 1 DIY candy kit $45.99 p/m (£35.47) Two of everything – double the snacks without double the price. Longer subscriptions are lower price. Shipping is included in the price. 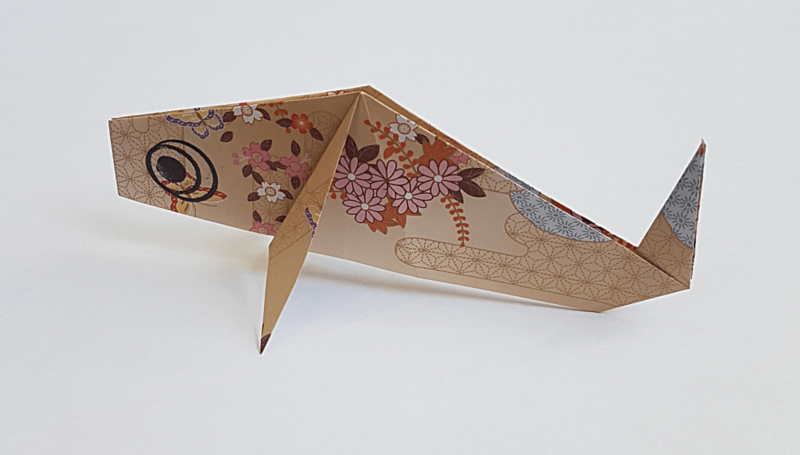 Also in the box is a handmade piece of origami! I love the anime-style picture on the box showing the business owners! And there is their actual picture! Such cute kids. 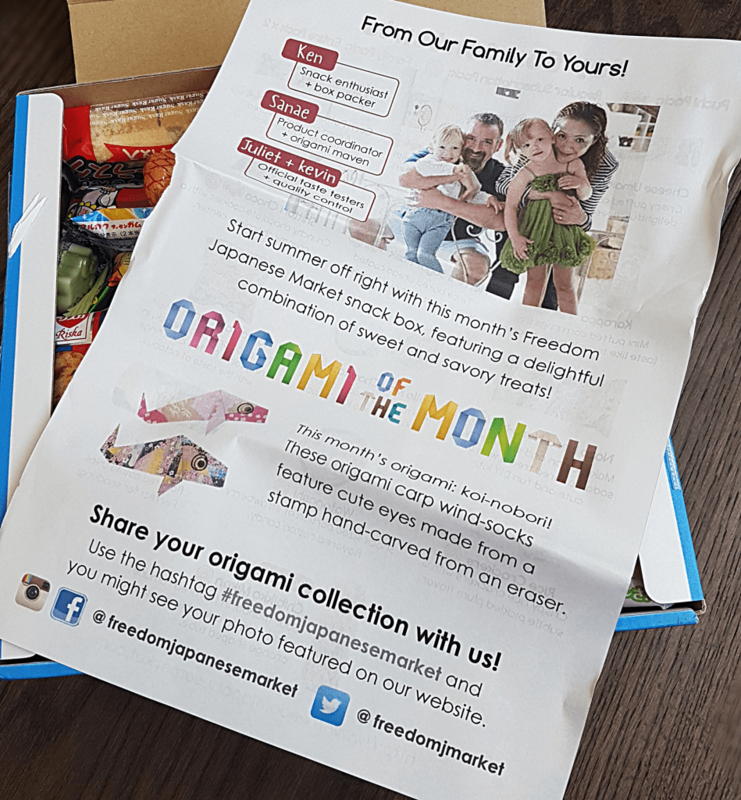 I love they include a piece of origami in every box, along with the explanation on the insert. ‘Origami maven’ is clearly not an overstatement. Isn’t that wonderful? And the fact the eye was printed using a handmade rubber stamp adds an extra dimension of impressiveness. At this point I was going to add a picture of the menu on the reverse of the sheet you see above. But for some reason I didn’t actually photograph it, so you’ll just have to pay attention to the photo descriptions. If you’re a devoted reader of my reviews you’ll know I LOVE Umaibo. 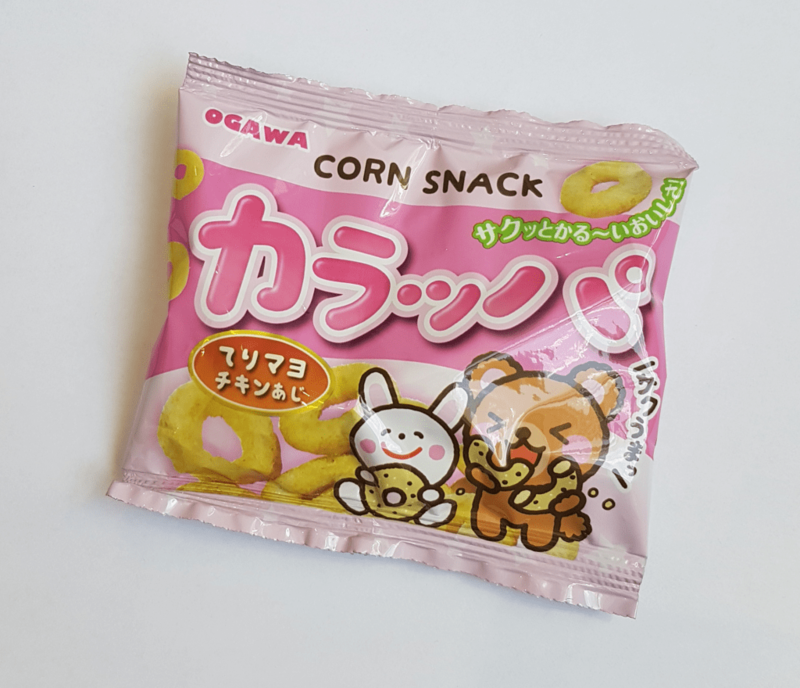 They are a puffy crunchy corn snack shaped like a tube, and are completely delicious. This one is cheese flavour, but they come in about a million different varieties. Umaibo also means ‘delicious stick’ in Japanese. Never a truer word spoken. This is Frozen Mango Gum. No, it’s not actually frozen, but it has a tangy fresh taste that sort of suggests coldness. I had to suppress a slight snigger when I saw the translation of this: Karappa. These are Teriyaki Chicken Mayo flavour mini puffed corn rings. The packaging is a great example of kawaii design. Look at the cute bunny and teddy! 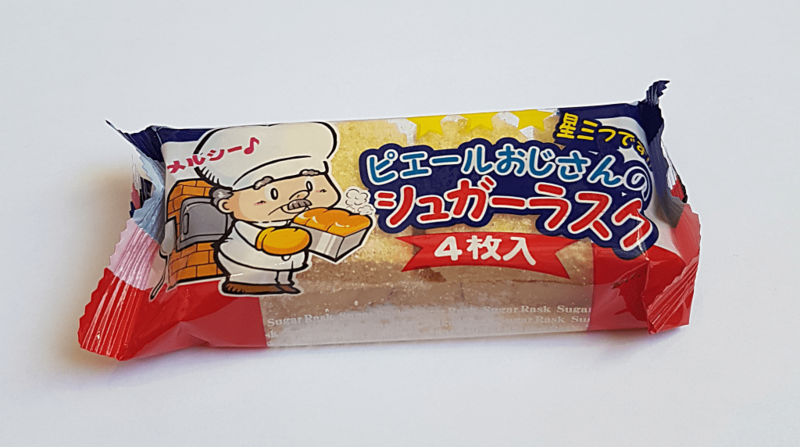 Here is a commercial version of another Japanese favourite: Pierre’s Sugar Rusk. Sugar rusk is a very popular snack, and is basically a sugary crouton made from bread, sugar, and butter and baked into crunchy squares. It sounds rather odd, and I always think of rusks as those horrible biscuits people give to babies, but if you like something simple and sweet and crunchy then this is pretty damn good. Plus I love the cheery chef on the package. Oh god, more sniggering. OK, it doesn’t actually sound rude, but I have a very juvenile sense of humour. 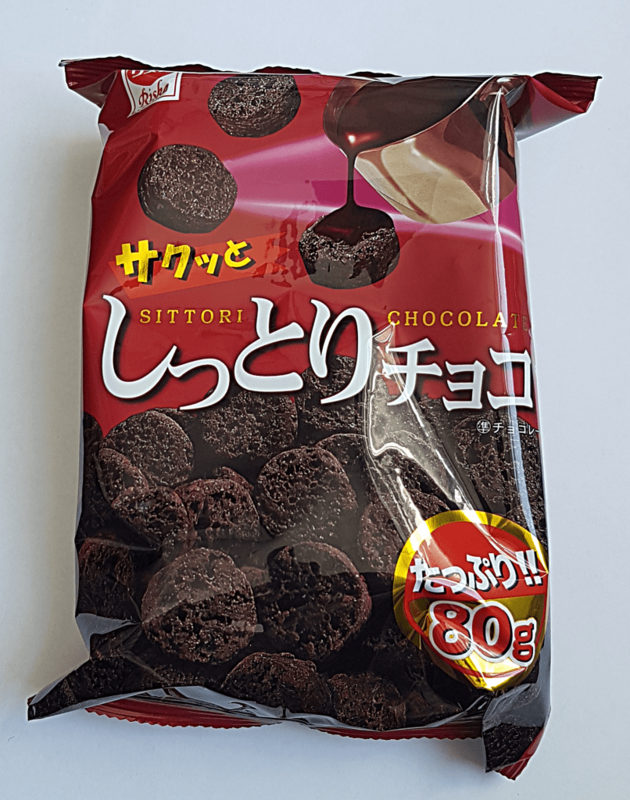 Here we have a bag of Shittori Choco, which are little crunchy corn snacks with creamy chocolate so they taste both crispy and melty. They are one of Japan’s most popular snacks. This is a big bag too. Yum. I love Japanese DIY candy kits, because it really feels like you’ve worked for your sugar rush. 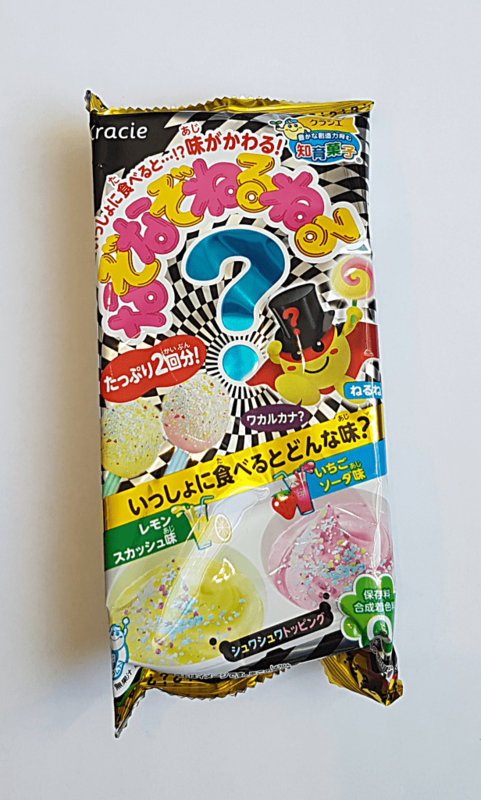 This is a Nazo Nazo Neru Neru Candy Kit in strawberry and lemon flavour, though when you mix the flavours together it produces a third mystery flavour, hence the big question mark on the package. The instructions are all in Japanese, but the little pictographs are easy to follow; it involves mixing powder with water and then dipping the resulting goo into little sprinkles. Incidentally. ‘neru’ means to stir or knead in Japanese, and ‘nazo’ means mystery. This is a sweet tiny little thing about the size of a 50p piece and about four times the thickness. 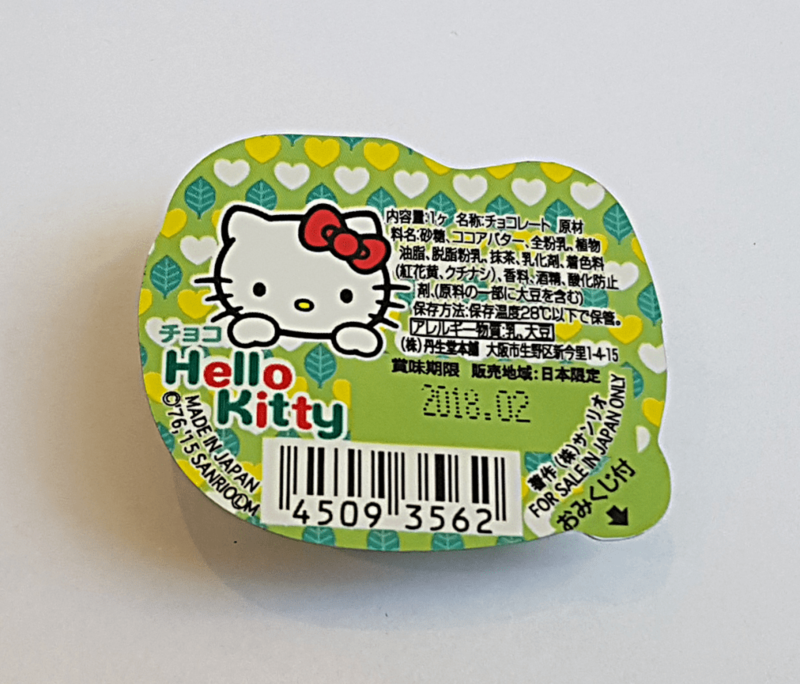 Hello Kitty is everywhere in Japan, one of the original kawaii characters, and this Hello Kitty Matcha Chocolate is a perfect little mouthful of cuteness. She looks kind of blurred but it’s the reflective effect of the plastic bubble package. 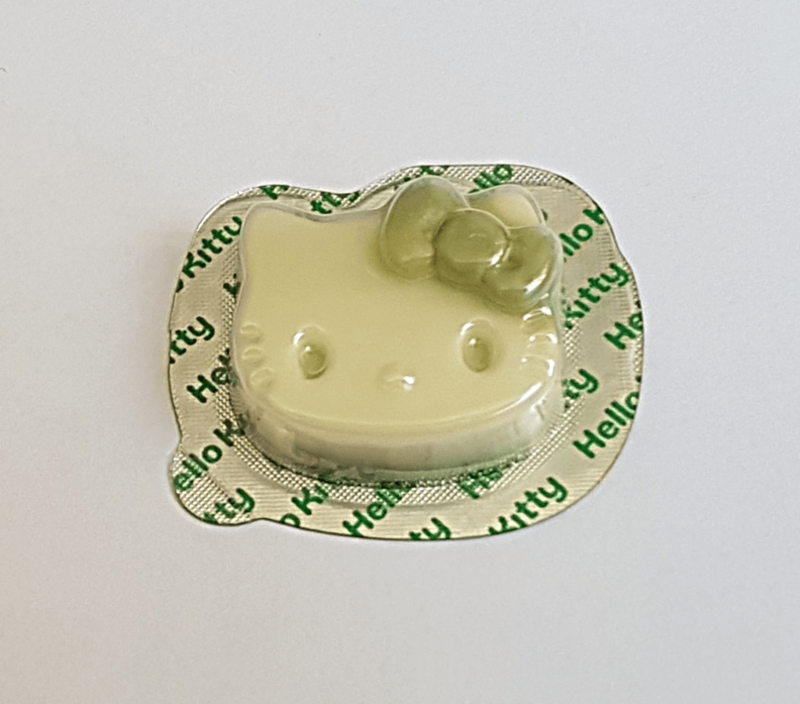 I love that Hello Kitty’s bow, which is usually pink or red, is green to match the matcha! Apparently the Takoyaki version of the Umaibo stick was so popular they released it in ring form! 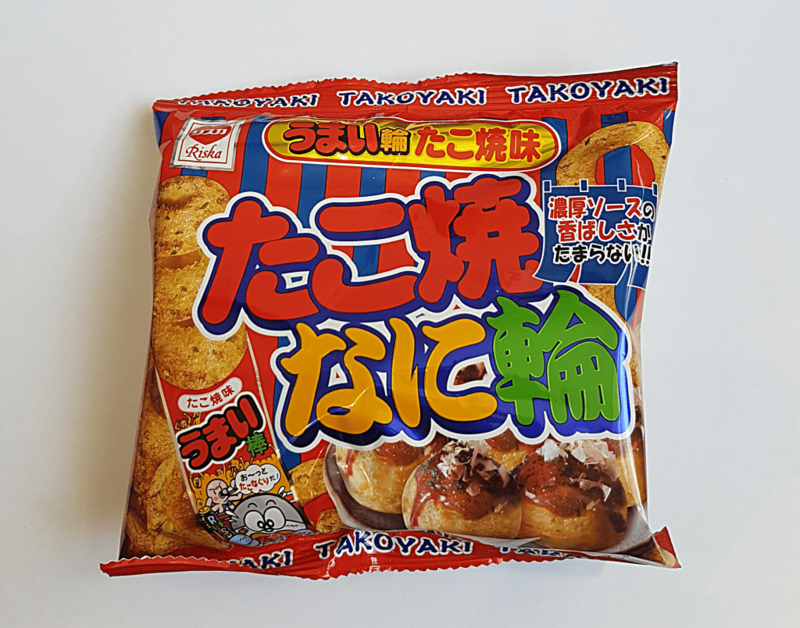 So this bag of Takoyaki Umaibo Rings is basically sliced up Umaibo sticks. Takoyaki are octopus dumpling balls. They may well be delicious but I can’t tell you because I’m allergic. Boo. I’m missing out on Umaibo. These combine two things which are very big in Japan: rice crackers and pickles. 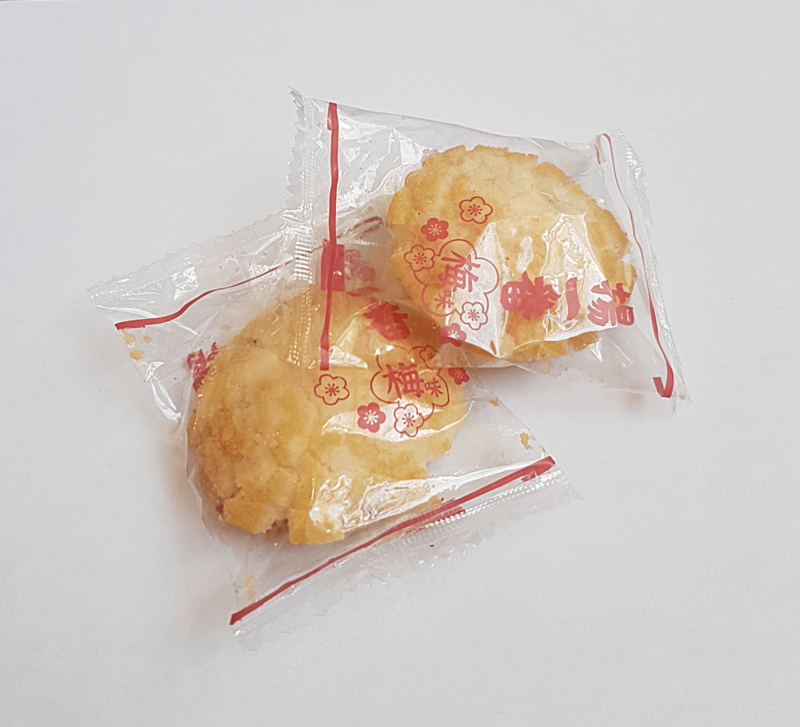 These Pickled Plum Rice Crackers are a lovely light crispy snack, with just the right amount of flavour so you get the pickle taste without them being overpowering. This is called Watagashi. OK then, yes, it’s cotton candy. It’s just as popular at festivals in Japan as in the West. As a family we’re not crazy about cotton candy, but I’m sure this little pot will find a happy home somewhere. 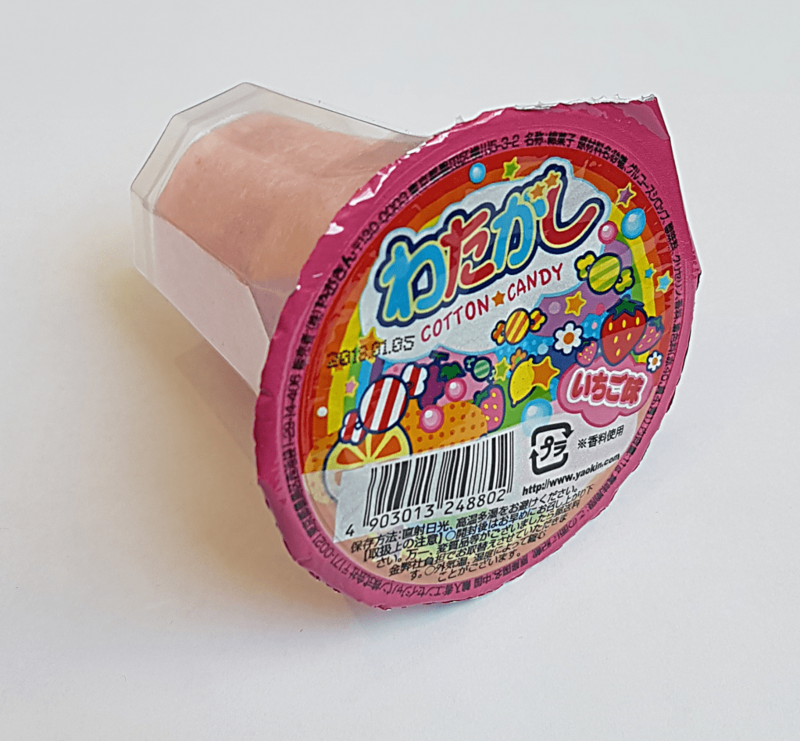 And if you like cotton candy it contains enough to enjoy without that sick feeling you get from eating the usual cloud that’s twice the size of your head. Chip Star Butter Soy Sauce Flavour. 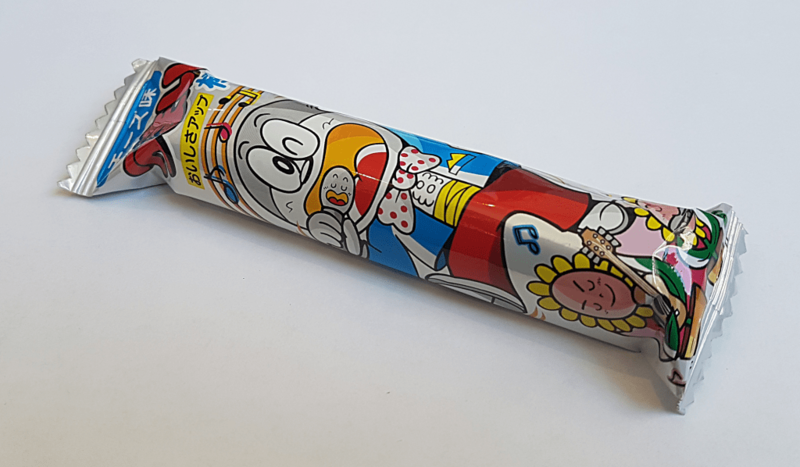 These are very popular snacks in Japan, and the tube is very handy because it keeps them intact. 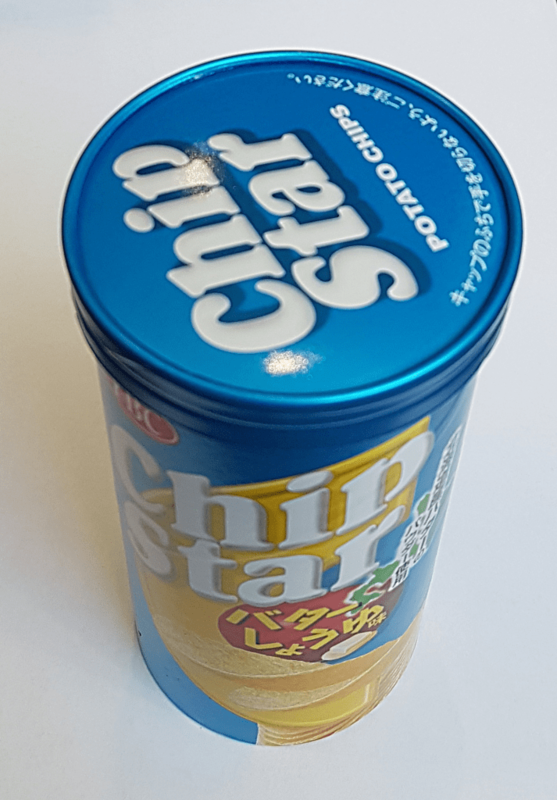 Chip Star are very similar to Pringles, but come in way more interesting flavours, including seasonal and limited editions. A final dose of cuteness. 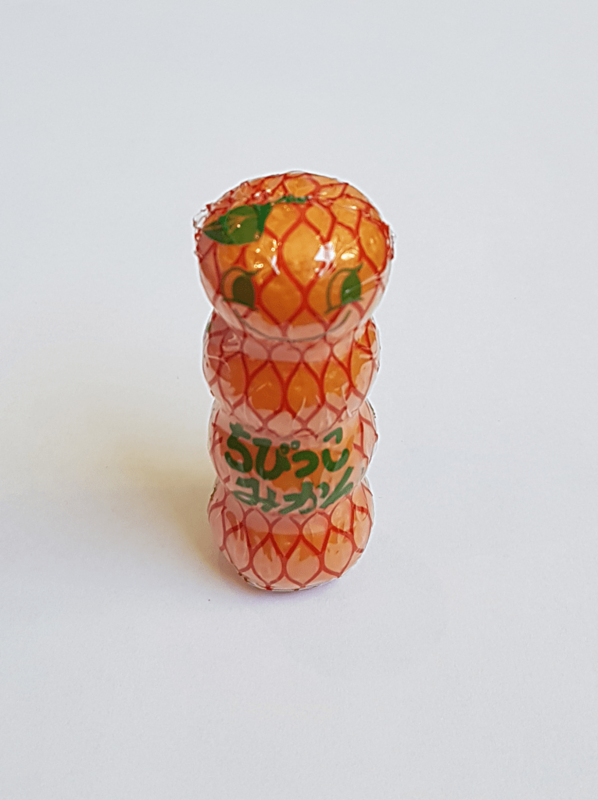 This is Mikan (sour mandarin) Ramune Candy, and the pot is shaped like a pile of little mandarins! And it’s smiling! Ramune is a type of Japanese soda pop, and the candy version is tiny fizzy sweets in a packaged shaped like the soda bottle. 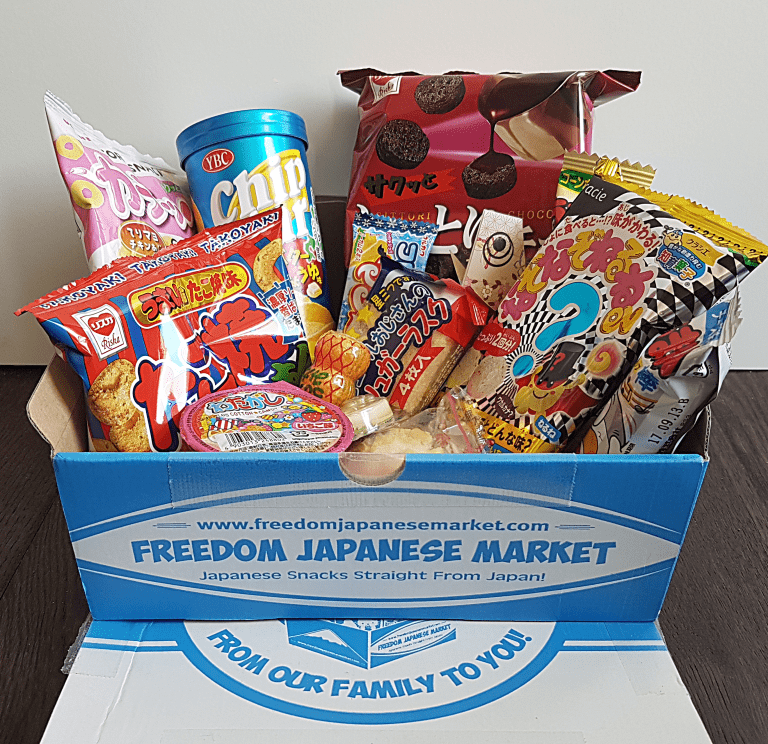 Once again this is a lovely box from Freedom Japanese Market. Of the thirteen items six are savory (or savory-ish, in the case of the rice crackers). As I love savory snacks as much as the sweets this is an excellent balance for me, even though I couldn’t eat one of them because seafood allergy. As it happens almost everything is crunchy, but again, I love crunch, and Japanese corn snacks are every kind of delicious, so I’m very happy! 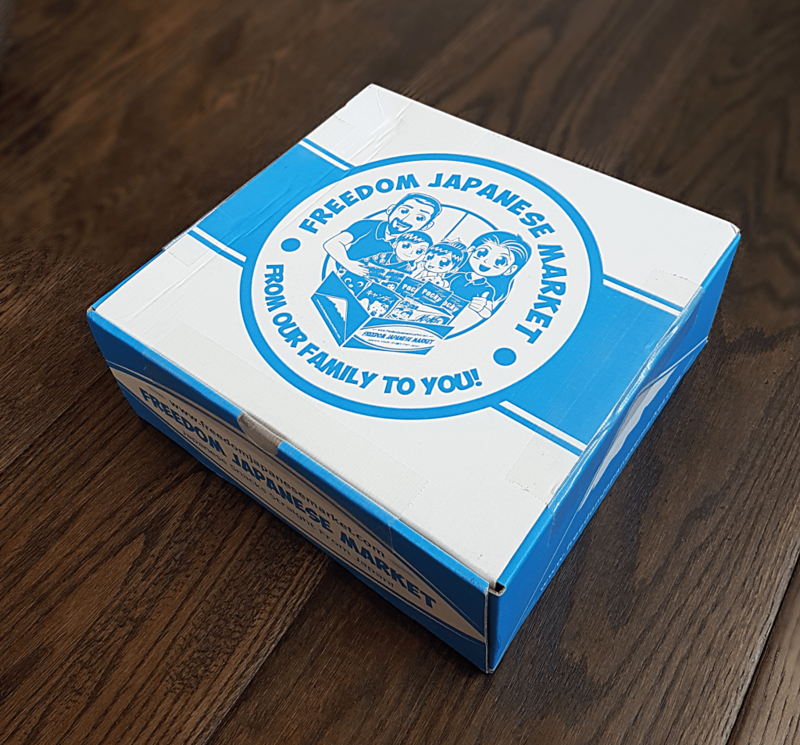 One thing which always impresses me about this box is that absolutely everything is properly Japanese, and by that I mean the real Japanese versions that you would buy in shops in Japan. 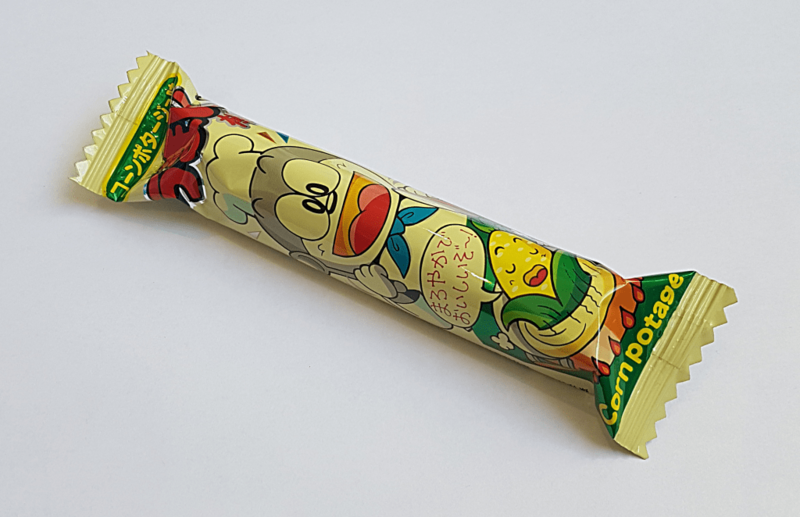 You can find various Japanese snacks in the UK, but those which are manufactured for the international market are frequently different from the home versions, and spend an awful lot of time in container ships getting stale. A lot of these items I could only find using Google image searches which took me to Japanese sites. That in itself indicates you’re not going to be able to simply hit up Amazon if you’re jonesing for an exotic snack. Or, in the case of Umaibo, you’re not going to have to shell out hundreds of pounds to get a case of 600. I mean, they’re delicious, but even I wouldn’t go that far. As to value, the price is perfectly reasonable. Snacks like this don’t have any UK equivalent (unless you count Pringles, and they sure as hell don’t come in butter soy flavour) so you’re not going to find a mix like this anywhere at home. While the price is OK for the Puchi box I think you’re much better off with the Original simply because you’ll get much more variety for not that much more money, plus a DIY kit, and those things are cool. And if you have a big family who are all crazy about snacks then of course the Family is ideal, because you don’t want to have to break up a fistfight over sharing an Umaibo. Having the shipping included in the price is very impressive, because this stuff is coming from an awfully long way away. I love that this is a family-run company, and that they put their names and faces to it. Their customer service (Kenneth!) is friendly and efficient, and they clearly think very carefully about what they send out. 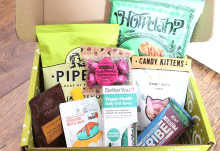 You can get a one-off box to try it out, though of course prices decrease with longer subscriptions. It would certainly be a great fun gift (looking ahead to Secret Santa perhaps?) or as stocking stuffers in general. But then, who cares about giving this stuff away, just buy it for yourself. 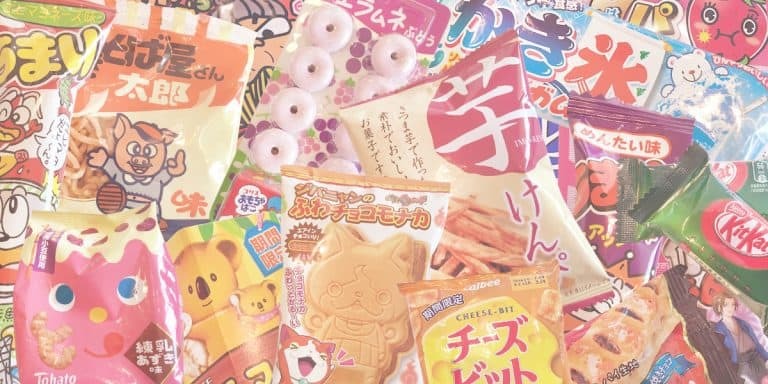 If you like trying new flavours, or simply have developed a taste for the remarkable variety of snacks Japan has to offer, this is for you.